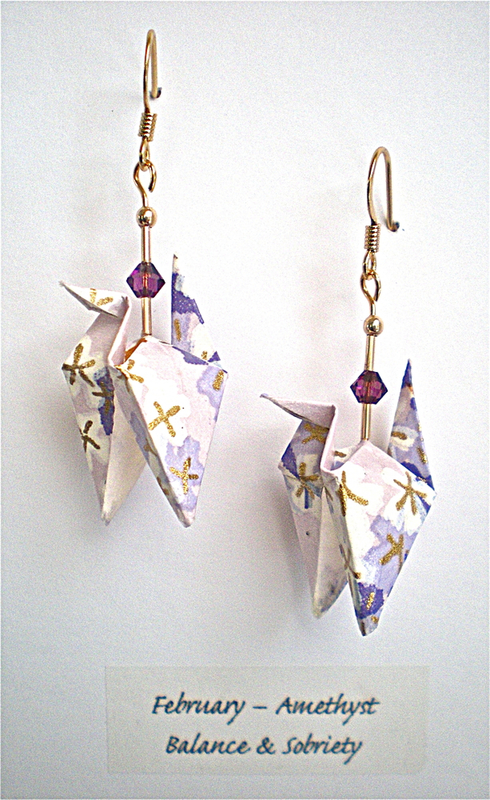 These origami inspired earrings make the perfect gift to celebrate a February birthday. Amethyst is the birthstone for February and is also the 6th anniversary stone of marriage! Each crane is folded 18 times from a 1.25" of Japanese Yuzen paper. Materials include gold plated stainless steel ear wires, 24kt gold filled beads, and Amethyst Swarovski bicone crystals. The paper is coated with a polycrylic medium for added durability and moisture resistance. 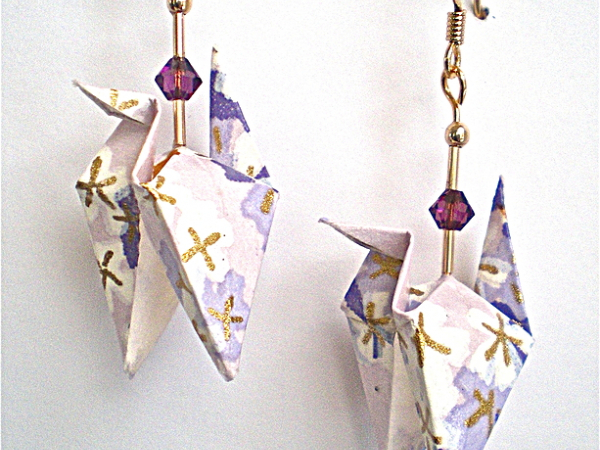 Earrings are attached to a descriptive card and ship in a brown kraft gift box. Amethyst is the birthstone for Pisces and is the 6th anniversary stone of marriage. The name Amethyst is derived from the Greek word amethustos, meaning sober. This rich purple violet stone is believed to promote clear thinking and good judgment especially when worn close to the head. It helps to sharpen the mind and relieves headaches, anxiety, and depression. Amethyst is a stone of peace. It is believed to lift the spirits and calm fears. It promotes internal balance and harmony. Virtues of amethyst include humility, sincerity, tranquility, and wisdom.